The newly renovated "Studio Bellavista" is located in the same house as our "Dependance delle Grazie" just a few meters from the lively piazza. The interior is furnished and decorated in contemporary and mediterranean style with a few antiques and local art works. From the small balcony and the windows you can enjoy the view of the sea, the beach at the Marina, the castello and stunning sunsets. The Studio sleeps 2 (+1) guests and has an annected garage. Just a few steps down from the church's square is the 'seminterrato' entrance with a well equipped kitchen. 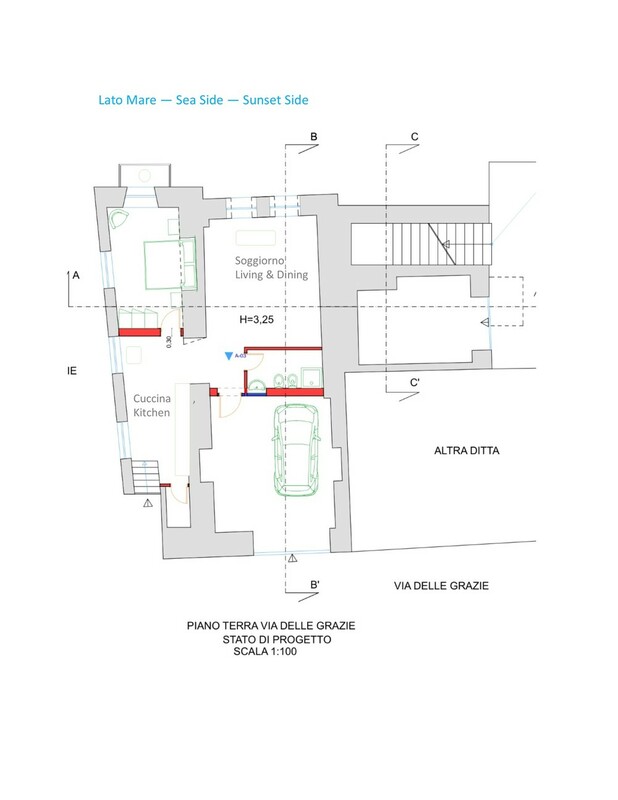 The Studio is only partly souterrain as it opens up with its facade facing the sea, the castello and part of the main piazza. We call this apartment "Studio" although it has a separate bedroom, becauses initially we considered renting it as an artist's workshop. In the kitchen and bedroom we preserved the original wooden ceiling and on the small balcony you can enjoy your morning coffee and afternoon aperitivo while watching the sunset. On clear days you can spot the active volcano Stromboli, which is part of the Eolie island group of Sicily in the Tyrrhenian Sea. You can reach the studio by car in about 30 min from Lamezia international airport (SUF). 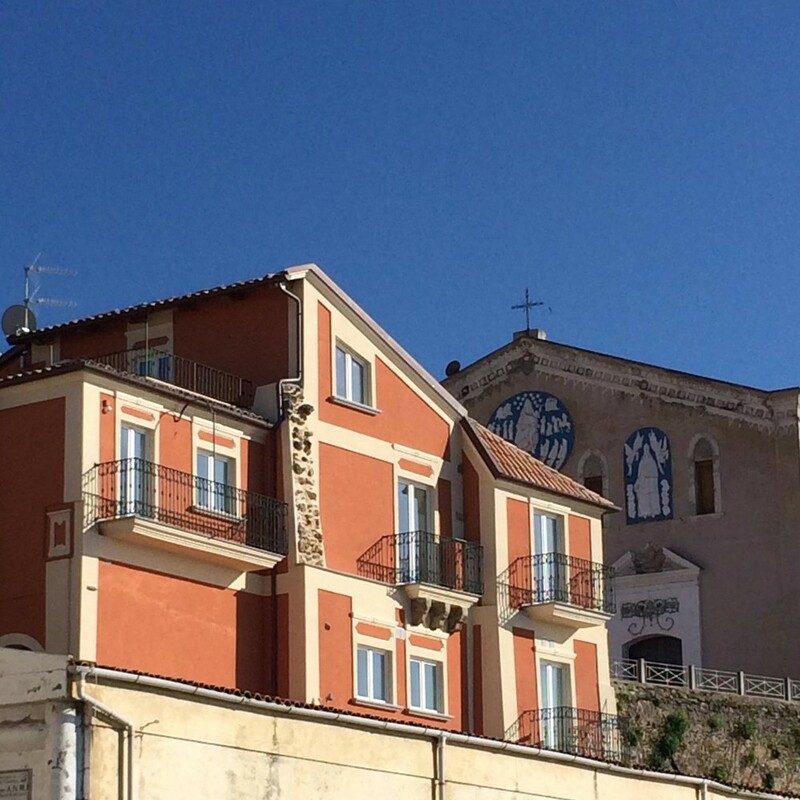 The studio is located in the centro storico of Pizzo. The Piazza della Repubblica, the main piazza of Pizzo, is a stone's throw, less than one minute walk away. From the studio to the beach at the Marina it is about 10 minutes walk downhill. Everything you might need during your stay is within walking distance: bars, restaurants, fresh market and shops. You actually do not need a car while in Pizzo. From May to October there are usually "Ape"-taxis connecting the different areas of Pizzo - which are La Marinella, Piedigrotta, Centro Storico, and Pizzo Marina. If you don't like to walk uphill from the beach back home, we recommend the Ape-taxi or to rent a car. However, if you want to rent a car - also to explore a bit of Calabria - please rent a car at the airport. There is no agent in Pizzo. Scooters could be arranged to be dropped and picked up in Pizzo. If you need a garage please contact us in advance. Our garage has a connecting door to the Studio which is ideal for people with restricted mobility. From Pizzo you can explore and discover the beautiful Costa degli Dei, the "Coast of Gods" - with its crystal clear, turquoise sea and many different beaches, as well as the many little villages with Greek history, scattered over gentle Calabrian highlands with thousands of olive trees and forests. The Studio sleeps 2 - 3 persons. Please note, no pets are allowed. The apartment is not suitable for small children younger than 6 years old (window to roof and stairs). No smoking is allowed inside. We can organise airport / train station pickup service at extra cost. Please contact us at least 2 - 3 days prior to your arrival to agree on a key-hand-over-time. Check-in is from 15.00 to 20.00. Thank you and see you in Pizzo! Do you still have questions? Please contact us, we are looking forward hearing from you.